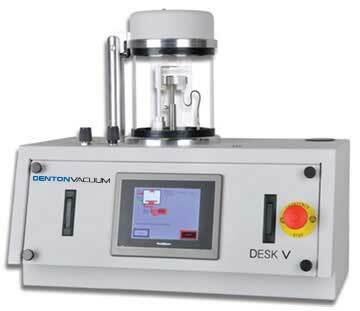 The Desk V Sample Preparation system, equipped for both evaporation and sputtering, is a high productivity solution that delivers exceptional, consistent and highly repeatable results. Desk V coating systems are available in two versions: Desk V HP and Desk V TSC. The Desk V TSC, the turbo molecular-pumped sputter coater option, is designed for high resolution microscopy samples and is suitable for oxidizing and non-oxidizing metals. The Desk V magnetron sputter unit precisely deposits a conductive coating and its thermal evaporation option deposits a thin layer of carbon (using rods or yarn). The Desk V deposits a broad range of coating materials (including iridium), while the adjustable rotating and tilting stage ensures a highly uniform coating with excellent conformity and coverage, even on samples with highly irregular surfaces. The Desk V includes an easy-to-change, drop-in style, insulated rotating specimen table, and its plug-and-play style eliminates much of the learning curve for you.